*Occasional and never – use with caution. The category “Mother” includes birth mother, step mother (including common-law step parent), adoptive mother and foster mother. The category “Father” includes birth father, step father (including common-law step parent), adoptive father and foster father. 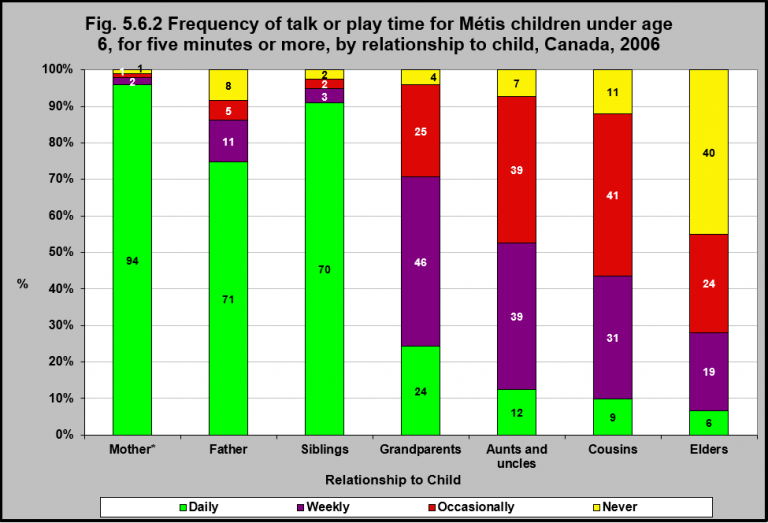 In 2006, 94% of Métis children under age 6 spent at least 5 minutes talking or playing with their mothers daily, focusing their attention on each other. With fathers, 71% of children under age 6 spent at least 5 minutes talking or playing. Forty-six percent of Métis children under age 6 spent at least 5 minutes talking or playing together with their grandparents on a weekly basis, and another 24% did that daily. Nineteen percent of Métis children under age 6 spent at least 5 minutes talking or playing together with their Elders on a weekly basis, and another 6% did that daily. Twenty-four percent reported they talked or played together for at least 5 minutes occasionally. Many Indigenous cultures have traditionally valued kin, the interconnection of family, and non-family community members in the care and socialization of their children.1 There is also an abiding respect for Elders for their wisdom, spiritual leadership, and role they play in the sharing and preserving of social values and beliefs, history, Indigenous knowledge and traditions. While family life has undergone enormous changes over the past 50 years in both Indigenous and non-Indigenous families in Canada, the importance of extended family to Indigenous peoples often stand in contrast to the more traditional nuclear family setting of mainstream Canadian society.2 These differing perspectives must be taken into account in the design and adaptation of community services for Indigenous peoples. 1Muir, N., & Bohr, Y. (2014). Contemporary practice of traditional Aboriginal child rearing: A review. First Peoples Child & Family Review, 9(1), 66-79.